The National Institute on Drug Abuse (NIDA) has redesigned two of its websites, Easy to Read and Learn the Link, for use on mobile devices. This new responsive design model automatically adjusts each page to fit the viewer’s screen for faster and easier viewing and navigation on a variety of mobile platforms, such as smartphones and tablets. The redesign launch will coincide with National Substance Abuse Prevention Month, a month-long observance that focuses on the role substance abuse prevention plays in promoting safe and healthy communities. NIDA is part of the National Institutes of Health. The Easy to Read website, launched in 2012, was designed for adults with a low reading literacy level (eighth grade or below). The site, which provides plain language information on neuroscience, drug abuse prevention and treatment, is also a resource for adult literacy educators. It has a simple design with a large default text size, motion graphic videos and other features that make it easy to read and use. The site also has a text-to-speech tool which reads the page to the user, if preferred. The new design is more engaging, with larger, more vibrant buttons which link directly to resources that provide answers to questions and concerns related to drug abuse. This website can now be viewed on all devices and screen sizes. The Learn the Link website, launched in 2005, uses TV, print, and Web public service announcements (PSAs) to deliver the message to America’s youth that using drugs and alcohol even once can lead to risky behaviors and serious health consequences, including the spread of HIV. This campaign, which is now housed under the NIDA main website to make it mobile- friendly, continues to raise awareness about the risks between drug use and HIV/AIDS, encouraging teens to share information with peers to prevent the spread of this disease. This website design is now more user-friendly and easier to access for teens, parents and educators. 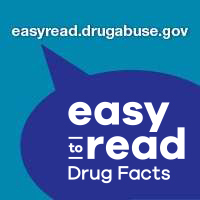 NIDA’s new Easy-to-Read site can be found at: www.easyread.drugabuse.gov. NIDA’s new Learn the Link website can be found at: https://www.drugabuse.gov/news-events/public-education-projects/learn-link-drugs-hiv or http://hiv.drugabuse.gov/ (this will automatically link to the new site). NIDA. "NIDA redesigns Easy to Read and Learn the Link websites for mobile devices." National Institute on Drug Abuse, 13 Oct. 2015, https://www.drugabuse.gov/news-events/news-releases/2015/10/nida-redesigns-easy-to-read-learn-link-websites-mobile-devices. NIDA. NIDA redesigns Easy to Read and Learn the Link websites for mobile devices. National Institute on Drug Abuse website. https://www.drugabuse.gov/news-events/news-releases/2015/10/nida-redesigns-easy-to-read-learn-link-websites-mobile-devices. October 13, 2015.